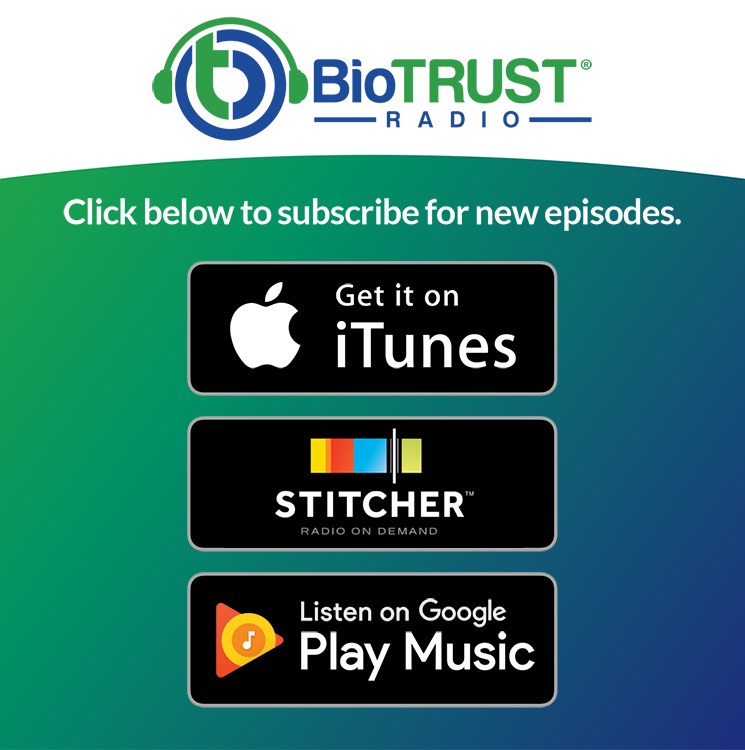 BioTrust Radio Episode #5: What is The Ketogenic Diet? Keto is all the rage these days. But what is the ketogenic diet? From the history to how it works to the benefits and science, get the full scoop on today’s hottest diet in this episode of BioTrust Radio, our weekly health and fitness podcast dedicated to answering YOUR nutrition, exercise, and supplement questions so you can get better results faster! In today’s show, Shawn (a keto expert) and Tim peel back the layers of the most popular diet to answer the burning question: what is the ketogenic diet? After you listen to the show, be sure to leave comment or question below. If we choose your question for a future episode, we’ll send you a FREE BioTrust product of your choice. In case you haven’t heard, there’s a (not-so-new) diet craze that’s taking the world by storm. It’s called the ketogenic diet, or keto for short. And while it’s recently experienced renewed interest and an explosive rebirth, it’s been in practice for nearly a century. Scratch that, it’s probably been used—in some variation or another—for as long as humans have been around. But what is the ketogenic diet? What can it do for you? How does it work? Does it live up to the hype? Is it the “best” diet? Should you jump on the bandwagon? How is keto different than the typical run-of-the-mill “low-carb” diet? When it comes to carbs, how low do you have to go on keto? What is the ketogenic diet macros? How much fat, carbs, and protein? What does keto, intermittent fasting, and Paleo have in common? If you’ve tried keto but haven’t experienced results, find out WHY. What is the ketogenic diet history? What does “The Father of Physical Culture” have to do with keto? How is Meryl Streep connected to keto? What are some of the ketogenic diet benefits? When it comes to weight loss, does the keto diet work? What are ketones? What is ketosis? Is it dangerous? Why do you have to be careful with net carbs, sugar alcohols, and fiber? What is the ketogenic diet most effective and beneficial for? How BioTrust’s very own medical advisor used keto to drop 40 pounds and boost energy levels. What are the two most important blood tests for healthy, graceful aging? We’ll cover these important topics to help you better understand exactly what is the ketogenic diet and much, much more. Enjoy! Low-Carb vs. Low-Fat: Which Diet is Really Better? Tim: One of the topics that my good partner Shawn Wells often gets asked to speak on is the ketogenic diet. What is the ketogenic diet? Well, the ketogenic diet is about as hot as diets get. Today we’re going to cover the ketogenic diet. Tim: Also known as keto. Shawn speaks around the world on keto. Even though it’s just become popular within last year, he’s been keto for how long? Shawn: On and off for 20 years. Tim: Twenty years. It’s a long time. It’s quite a long relationship. It’s longer than any girl I’ve ever been with. Shawn: Well, that’s a great intro, Tim. So, I will ask you, because I know you’ve actually written papers on the stuff. You are a sport nutritionist. You’re a very brilliant guy. And yes, I live the keto lifestyle, and yes I speak on it. But let’s trade off a little bit here because I know you’re very knowledgeable as well. So, to you, what is the ketogenic diet? How would you define it, Tim? Tim: That’s a great question, and the simplest answer that I would come up with is just that it’s a very-low-carbohydrate diet, and a high-fat diet. Tim: So those are fairly arbitrary terms. And many people think that all low-carb diets are the same. But keto is significantly different from just your run-of-the-mill, “I’m going to eat less carbs. I’m cutting back on carbs.” We can talk more about percentages, but just to put it in perspective, “low carb” can mean anything, in the research, it could mean anything up to like 25-26% of your calories, probably even 40%. I think we’ve seen some studies say low-carb is 40% of your calories. We’re talking about 100-200 grams of carbs, which is a lot of carbohydrate. By comparison, keto is typically less than 30 grams of carbs per day. And just as a general idea of how much fat we’re talking about when we say “high-fat,” it can be up to 80%, maybe even more fat, depending on how keto is designed for you. So that’s just kind of an overview of how I would define keto, is very-low-carbohydrate and high-fat diet. And probably just add to that moderate amount of protein. Shawn: That’s an excellent overview. Now why on the protein? Tim: Yeah, could potentially lead to a process called gluconeogenesis, where the body converts the protein, basically—not to get too complex with deamination and whatever—the body can convert that protein into a carbohydrate, and so that can interfere with ketosis. Tim: So that would be probably one of the reasons why. Another one, if you’re eating too much protein, you may not be eating enough fat. So that might be another reason why we want to keep protein moderate. It’s not low, but it’s definitely not high, so it’s somewhere usually in that 15-20% range for keto, I would say. Shawn: Yeah, exactly. And I think one of the things I hear most often with the diet is, “It’s just not working for me. I feel this brain fog all the time. I feel hangry,” which is the hungry/angry hybrid word. And almost nine times out of ten, when I ask someone, “How much protein are you eating?” and like sure enough, it’s like this idea of “eating clean,” which means I’m going to eat super-low-carb but I’m going to eat super low-fat, which leaves you with a diet of like pure protein almost. Shawn: And it’s punishing. And I don’t think it’s bad to have a lot of protein. We’ve seen studies from like Joey Antonio, like we were talking about the other day, that you can eat a very high amount of protein and it not affect your kidneys. That is a complete myth, unless you have kidney dysfunction, renal dysfunction. Then that is a different story. But I think when you’re eating super high protein and you’re going through this gluconeogenesis process and you’re basically inefficiently making glucose, and so you’re not really carbohydrate adapted as well as you should be and you’re not really ketone adapted as well as you should be, to use fats and turn them into ketones for fuel, it’s kind of like this nebulous world. It’s punishing. You talk to a lot of bodybuilders that eat this super high protein diet, most of that protein you’re just oxidizing. It’s not even, let’s say, going to the amino acid pool to be used to build muscle. But nine times out of ten, that’s what I hear. And when I dig in, “Well, is your fat high enough? Is your protein moderate,” like you said, 15%? Fifteen is like, I would say, is for someone that’s very sedentary; 20%, I would say, is for someone that’s active; 25% is where I would put someone who’s an athlete and maybe a bodybuilder. That’s as high as I would go. So it just depends on maybe level of activity and maybe lean body mass that you have. There’s no exact formula for that, but that’s what I’ve seen. So, let’s get into the history of the ketogenic diet, which you have done some good work on. You know more about this than even I do. I know about there’s the Inuits that Jeff Volek, Dr. Jeff Volek, has spoken about. That was a tribe that you can read up that they essentially were on the ketogenic diet. I think about 90% fat was their diet. Certainly there’s Eskimos, and then we can get into early 1900s and epilepsy and all that stuff. What can you throw at me, Tim? Tim: Yeah, sure. I think just going to the Inuit/Eskimo example. They’re not trying to be on the ketogenic diet. They’re just eating what’s available to them. And I also want to highlight what you said that even though we’ll give some percentages, we’ll give some numbers. Keto, just like any other diet, it’s about finding what works for you. So we’re going to come back to that, but there’s not like a “one size fits all,” and I like to actually talk about diets as being more of a compass than actual directions in terms of a map. In the sense that it’s basically designed to point you in the right direction, but you have to continually tune into your internal and external environment to see how it’s working for you. Shawn: Right, and actually just as a quick aside right there is that Paleo and Primal…Paleo may have kind of started low-fat, but it’s definitely I think now that we’ve dug in more, I think it’s definitely Paleo and keto are aligning quite a bit. If you look online, you’re seeing those. You’re seeing intermittent fasting, paleo, and keto almost coming and converging on “the one diet”, “the one true diet”, and you’re seeing that quite a bit. And I think if you were to go back and look at those kinds of things, based on what you said, “availability,” I think you’d see that during the summer months—depending on where we live. Certainly Eskimos, I mean, it’s winter for them year-round. They could eat keto year‑round, probably. But if we were to look at just regular Native American tribes or whatever further back, we would see probably during the Summer months, Spring and Fall maybe, that it was largely a carbohydrate-driven diet. And then, maybe during the winter, before there was food storage techniques and some of those kinds of things where you could maybe even have grain silos and all these things that have come about with modern society, they would have been largely eating ketogenic. They would have been eating animals, and they would have been going several days probably without eating, which is just intermittent fasting, which puts you deeper into ketosis. So most likely, there’s this idea of “dual fuel”—glucose and ketones—that this whole ketogenic thing is not that odd. It’s not that crazy. Quite often in your life, whether you knew it or not, you have been ketogenic just from when you didn’t eat for 18 hours because you went to sleep, you didn’t eat when you got up, and you raced off to work, and you had some coffee maybe, or maybe you just had some cream in your coffee. And there you go, you’re ketogenic. It may not be super deep into ketosis, but then maybe if you were really active and you just keep adding things on. Chances are you’ve been ketogenic at some point. And if you go back in history, I think it would have been very common where people weren’t eating all day long, which is not normal, especially as you as you pointed out, like with food availability. So even during those summer months, when they were eating carbohydrate, they may have gone a few days without eating because they were traveling and they just didn’t have food on them or because they were highly active, or those things. Tim: Yeah, there’s a lot of insight there, Shawn. That’s great. I guess we can go back to answer the question about what is the ketogenic diet history. There’s some things you touched on there that we kind of want to run with, because you talked about fasting a little bit. Actually, some of the history of the ketogenic diet, some would trace it back to the Bible, as Jesus using fasting as a way to cure epilepsy. So, we’ll tie that into the ketogenic diet in just a second. But fast-forward to the 1900s and people started to realize, or doctors started to realize, that fasting was the best way to treat epilepsy. So, after about 2 or 3 days of fasting, people that had epilepsy, their seizures would subside. And so that started to raise some eyebrows. They weren’t really understanding why that was happening, but they just noticed that this fasting was highly effective at treating epilepsy. One of the guys that really stands out to me is a gentleman named Bernarr Macfadden, and he was known as the “Father of Physical Culture.” He was the author of a magazine in the 1920s called Physical Culture, and he was of the belief, kind of like we are today, that many of our ailments could be prevented, treated, cured, what have you, with physical activity and nutrition. He was what I call a pioneer, because I think he was way ahead of his time, to really understand those things. But he specifically was a proponent of fasting for treating disease because his mindset was that when you eat food, your body starts to focus on the digestion process. And if you eliminate that, which is a very calorically expensive process, that your body starts to be able to heal itself. So, he was basically going around telling people this and most people thought he was crazy, but there was one doctor—the name escapes me at this point—but there was one doctor who caught on to what Mr. Macfadden was saying and he’s like, “Well, let’s look into this.” So they started to research it more and there were a few other doctors who caught on after they listened to presentations by this one guy. I have it documented in one of the longer reports that I wrote, so if you’re interested in finding the specifics of the history, we can give you that report to take a look at. Finally, what they started to realize was that after two or three days, again, seizures related to epilepsy would go away. And as they did more and more research, they needed to figure out what it was, because you can’t fast forever. First of all, it’s hard to go that long. Second of all, it’s pretty final, if you continue to fast. Tim: It’s kind of like, “Well, I don’t like the seizures, but I’d rather be alive.” Some doctors finally found what was going on and what we can shift into here is why it’s called the ketogenic diet. What they found was that the body was shifting away from burning carbohydrates for fuel and instead relying on fat and byproducts of fat. This byproduct is called a ketone, and I’m going to let you get into that a little bit more in just a second. But again, I can’t remember the name of the doctor off of the top of my head, but what he came up with was a ketone-producing diet, so that these patients that had these seizures could eat and treat the seizure without fasting. So, I think that they were allowed a maximum of 10 to 15 grams of carbohydrate, and they were allowed 0.4 or 0.5 grams of protein per pound of body weight, or per kilo. I can’t remember exactly what the number was, but it was a minimal amount of protein and the rest was just fat. So, that’s a little bit of the history behind it. And then it kind of got silent for a while, until the Atkins diet started picking up again, maybe 70s-80s, and then really more popular in the 90s. Then in the 90s, there was Charlie Abrahams. I think that’s his name. Charlie Abrahams was a young boy, a two-year-old. Shawn: Right. The Charlie Foundation. That’s cool. Tim: Yeah, the Charlie Foundation. So, Charlie Abrahams had epilepsy that couldn’t be treated with drugs. His parents found out about the ketogenic diet, and within a week his seizures were gone. So they became advocates of the ketogenic diet, as a result, and that’s where you said that you can find out more on the Charlie Foundation website. Shawn: Yeah, it’s a great site. Tim: What people may be more familiar with is a movie that came out. Charlie’s dad was the Producer, I believe, of a movie called Do No Harm, with Meryl Streep. And that was kind of loosely based on Charlie and his family’s history with the ketogenic diet and the medical community, to some extent too. Anyway, that’s a little bit of the history. Shawn: Another interesting fact on that is what’s really crazy, is he went on the ketogenic diet, but later on he got off the ketogenic diet and never had a seizure again. Shawn: So it’s not necessarily just therapeutic. In that case it was curative, which is really interesting. Like maybe it hit some kind of reset button. I think a lot of this stuff, if you trace how well the ketogenic diet works for all these disease states, a lot of these disease states people say it correlates to things like glycation, which is damage to the cells from sugar, like too high a sugar. But there’s also inflammation. But usually glycation precedes inflammation, and inflammation certainly correlated to a lot of chronic diseases, but that’s correlation. If you go back to the reason, I really think the data is showing that it’s mitochondrial dysfunction—this gets a little crazy, but I’ll talk to it in a second—and insufficient cellular energy. It’s an acronym called ICE. And basically, if you look at Type 2 diabetes, Alzheimer’s, Parkinson’s, cancer, and these kinds of things, there’s dysfunction going on. And the mitochondria, if you remember, the powerhouse of the cell, and it produces ATP. So that’s producing energy, and if there’s issues with glucose producing energy, creating ATP, then maybe you can use ketones as an alternate source to create energy for fuel. And that’s why in these numerous conditions that we’re seeing really therapeutic benefit from, like I said, with Parkinson’s, with cancer, with Type 2 diabetes, Alzheimer’s. You can look up Dr. Mary Newport’s story with her husband who had Stage 4 Alzheimer’s, and she was able to move him back to Stage 1. She started with coconut oil, then she got into MCTs, and then she got into ketone esters and salts, I believe. Just trying all these different things that essentially elevate ketones, and she had him on a ketogenic diet as well. He was more lucid, more cognizant for several years. He eventually did die. It’s not necessarily a cure, but it’s certainly therapeutic, and he had a much better quality of life. And with Type 1 diabetes, actually it’s very similar the way they used to treat that before, as best they could. Before insulin was synthesized or before they had pig insulin, porcine insulin, what they would do is they basically ate very little. They were fasting most of the time. Of course they got very thin and not necessarily very healthy. But they would try and give them a very low carbohydrate diet. And that wasn’t the solution, it wasn’t the best solution. They certainly don’t have the quality of life that a Type 1 diabetic would have now, but it’s very similar to what you were talking about with epilepsy. So, when asking what is the ketogenic diet, it’s not just a weight loss diet. There’s a lot going on here. I guess my point is one, it’s bigger than weight loss. We have all these disease states that it’s being researched in. Some are very conclusive, like epilepsy. Some are new in the research, like cancer. But also, there’s a bigger picture here with the cellular energy, in that we are meant to use multiple sources of fuel. That has kind of gone away with the Western diet, the modern Western diet, where we have processed carbohydrate all day long, every day. We’re surrounded by it, we can get sodas, we can get candy, we can get bread, and bla-bla-bla-bla-bla-bla-bla all day long. This isn’t very indicative of like what would be at paleo primal evolved whatever diet, ancient diet that we were probably meant to have. So it’s interesting to look at it. Take a step back and it’s more than just a diet. It’s really looking at our genetic makeup and what we’re evolved for, and I guess that’s my point. It’s just bigger than weight loss. There’s a lot to talk about with this. Shawn: You just need a balance. Tim: Yeah, to extremes. And that makes sense. Everything can work, I guess, when you talk about weight loss. But to your point, we’re talking about more than weight loss. When we opened the show, we talk about being a trusted resource for fitness, nutrition, health and human optimization, and our body has the capacity to do these things and that’s what you’re talking about. Maybe this is an optimal way, or at least some of the time, is an optimal way to eat. So I really appreciate that insight and I hope that people can grasp ahold of that. Now, we’ve talked about ketones, we’ve talked about ketosis, we mentioned the name ketogenic diet, but maybe let’s take a step back and just remind people why it’s called the ketogenic diet, or just kind of explore that, specifically. Shawn: Yeah, there’s three ketones. There’s one that’s called “Beta-hydroxybutyrate,” which is also known as “BHB,” the acronym. You can actually get supplements now that are BHB salts or BHB esters. It’s a very new area of supplementation. There needs to be a lot more research there. There’s another one called “acetoacetate” that gets abbreviated as a “AcAc.” Then there’s “acetone,” which is that fruity smelling smell that you get your breath or urine that people have talked about, like “Oh, you’re deep in ketosis and you get that smell.” It’s not necessarily a bad smell, but sometimes people can smell it. But yes, so there’s ways to measure ketones by using blood, urine, or breath. They have these breath meters that are very similar to what you would use for blood alcohol content, that measures acetone in your breath. And then there’s blood BHB, like any decent glucometer that you would measure blood glucose with, like a diabetic would typically do. You can buy strips—they’re not cheap—at a good price they’re about $2 apiece for the BHB strips, and you can test your blood. That’s really the most accurate way to test, period. These other ones are a little one-off and there’s some things that can cause them to maybe not be as accurate, but it’s obviously a lot cheaper to do the urine or the breath. And then you’ve probably seen or most people have seen the urine strips. That’s very common to use those. Most people that we’re doing Atkins, like you said, in the 90s had those strips. They’re pretty good at the beginning, but I feel like as you get more keto-adapted, I think it’s less accurate, and that’s where I would probably put more reliance on blood BHB. So, ketogenensis means that you are creating ketones, so you’re creating these ketones, basically, from metabolizing fat. So you’re using these ketones as fuel. Do you want to say anything more on that? Tim: Yeah, because I think that’s going to be really important for people who aren’t familiar with it and really want to know what is the ketogenic diet. Just going back to all that to kind of tie it together, under normal circumstances, especially like you talked about with processed carbs all day long, our bodies are essentially carb burners. And under those circumstances, our brain relies on glucose for fuel. So, pretty much everyone, all day long, is burning a lot of carbs. Because the fat itself can’t cross the blood-brain barrier, you’re not necessarily burning fat. That’s why people say, “You need carbs,” because your nervous system can only use glucose. Shawn: But you can make carbs. Tim: Right. And so, you can get into a fasted state—and this is goes back to that history that we talked about—your body doesn’t have carbs to burn, so it has to come up with this “alternative fuel” or the “dual fuel” that you talked about. So eventually, even though the carbs are gone, the body can’t make carbs, can’t break down, and there’s no glycogen left, your body starts to make an alternative fuel from fat that can cross the blood-brain barrier so that you can survive. And that alternative fuel is ketones. So that’s kind of why they call it the ketone-producing diet or the ketogenic diet. But not only the brain can use ketones, but your heart, your muscles, and all the cells. Your body basically can use these ketones. So those ketones are the ones that you had mentioned, and so that was kind of one thing that I wanted to basically remind people is why is it important to measure ketones? Well, for a number of reasons, but one, it’s a signal that your body has shifted from being a carb-burner or more of a carb-burner. Under normal eating circumstances you’re typically burning a mixture of fuels—carbs and fats—but when you go from normal to ketogenic diet, you’re basically a predominant carb-burner to a fat burning machine, essentially, because you don’t have carbs to burn. And so there’s that. And then, I guess, just because we talked about measuring ketones, I think it’s important to maybe have a small discussion on the difference between nutritional ketosis and ketoacidosis, because I hear sometimes people like, “Oh, you don’t want to have ketones too high because it’s a bad thing,” and while that is true, does the average person who is healthy have any risk of really getting into ketoacidosis, a dangerous level, just by eating a ketogenic diet? Shawn: So, that’s a great point and this comes up a lot, especially with dieticians and doctors that are in a clinical realm. They’re so used to seeing, “Oh my gosh, ketones!” Like that means that you’re very sick if they see ketones, and they don’t understand the difference between nutritional ketosis and diabetic ketoacidosis. The diabetic ketoacidosis will only happen—there’s literally been not one documented case that there could be an exception—it’ll only happen when there’s no insulin. So this has to be a Type 1 diabetic, and yes, you can get into diabetic ketoacidosis, potentially. But I will still say this, that even Type 1 diabetics, that don’t make insulin—and of course they can take insulin like Humalog and whatnot—they do better on the ketogenic diet because they have less hypo and hyper glycemic episodes. And they have more controlled blood glucose levels as a result of being on the diet. But they certainly need to track ketones and be aware of it. But for everyone else that does make insulin, it cannot happen. So, there’s blood BHB, like we talked about, 0.5 millimoles, I don’t know will need probably not too much unless someone does track it with a glucometer. That means that you’re just getting into nutritional ketosis. And you can get up to like 5, 6, 7 maybe, if you’re doing fasting along with the nutritional ketosis and working out maybe. But then, this diabetic ketoacidosis is many-fold above that. It’s like more like 20, 25, 30, 35 like up there. So it’s not even comparable. And I will say, that for the people that are on a ketogenic diet—thinking of the blood levels has made me think of this—that that don’t do fasting, they’re kind of doing themselves a disservice because you’re really close to getting into this incredible realm of cognitive clarity that people get when they do long fasts. But if you’re already a ketogenic dieter, you can just do intermittent fasting, which is let’s say 16 hours without eating and 8 hours eating, or another one is 20 hours not eating and 4 hours eating, a day. And you try and get in all your calories for the day in that 8-hour or 4-hour window. But what’s amazing is during that that fasting, along with the ketogenic diet, you have this incredible cognitive clarity that happens like maybe above 3 millimoles BHB, let’s say. So, if you’re always just “kind of” in ketosis and you’re eating a lot of sugar alcohols and fibers, and like all this stuff, and you’re always saying like, “Well, I’m in because of net carbs,” and all these calculations and you’re kind of like doing all this stuff, and maybe you’re grazing all day long and you’re eating a lot of protein and some of the things like we talked about, you’re probably still seeing benefit from being low-carb and not eating candy, not drinking soda, not eating all these processed carbohydrates. But you’re probably not getting to that point of like the “wow” that some people say like, “Oh my gosh, I feel so much energy. I feel like so much cognitive clarity,” and all this stuff that it really only happens like when you are pretty dialed into your diet and your fasting. But it’s definitely worth it. So if you’ve never experienced that, but you’ve done “keto” or low-carb, then that’s why. I would throw that out there. Tim: Yeah, that’s a great point, Shawn. And it kind of leads into the discussion of what is the ketogenic diet benefit—or, benefits. We talked about the therapeutic benefits already, and we can elaborate on those things. I’m not real sure if most of our audience think that’s something that we want to speak to more. But we talked about epilepsy, obviously, being kind of a foundational therapy, that all that the neurocognitive benefits. Tim: Exactly. So you talked about Alzheimer’s, Parkinson’s, and then Type 2 diabetes. I mean, if you have a problem processing carbohydrates, it kind of makes sense to remove them. Shawn: And yet, that isn’t the traditional advice in the medical realm right now. Tim: But Antonio Paoli, who has written several papers helping answer the question what is the ketogenic diet, there is one that that’s been a great resource for me. It’s called Beyond Weight Loss, and it talks about some of the advances that have been seen. It really elaborates on the glycemic control benefits of the ketogenic diet. So it’s markedly effective at improving glycemic control, lowering insulin levels, and just having substantial benefit. There’s heart health benefits that we can get into a bit more, as well. But some of the subjective things that you talked about, I think are really important to point out too. I was talking to Dr. Matt Roberson, recently, who you helped understand what is the ketogenic diet, and he dropped 40 pounds in a fairly short period of time, in my opinion. From September to March, lost that 40 pounds, and he’s kept that off for the last 5 months just by sticking with his diet. I kind of asked him, subjectively, what did he notice, and he described it as “feeling more energy,” like you talked about, and more clarity. But he said “clean,” and I thought that was a really cool word to use because he not only talked about his body feeling cleaner because of the weight loss, but lacking that brain fog that probably subsisted over time. Shawn: And that’s cool because he’s literally my medical doctor, and he was very open to learning about this stuff and applying it to his life. Yeah, it’s made a huge difference in his life. And I think when we talk about energy and brain cognitive clarity or whatever, I think you have the energy from having your brain function better. But I think you’re also getting energy from losing weight. Shawn: Some of these people, like you said, are losing considerable amounts of weight. I have like the studies that are in your article. It was in the journal Endocrine for two months. Two months in, the ketogenic dieters had lost 30 pounds in the study, and the standard low calorie dieters lost 10.5 pounds. That’s crazy different; two months, 30 versus 10. Then at 12 months, 88% of the ketogenic dieters lost 10% of their initial starting weight, and that was three times the weight loss of the low calorie group. Then there was another one from the American Journal of Clinical Nutrition, which is a really respected journal. Four weeks, so like a month or not even, 14 pounds on the ketogenic group. And that was 46% better than those on moderate carbohydrate. And the average studies showed 2 to 3 times the weight loss over heart healthy or low fat diets. I think really, at this point, the only ones holding on to that questionable direction is the American Heart Association. It seems like the tide has been turning in most of the other medical bodies, if you will, like the Academy of Nutrition and Dietetics, and it’s been slowly changing that we’re getting away from this idea of low‑fat diets that really are not heart healthy for so many reasons. So finally, that that tide is starting to turn. But you talked about some of the benefits, I think this, when you look at like higher fat diets, they are heart healthy. That’s why the Mediterranean diet, in particular, is one of the ones that comes up, or Syndrome X diet. There’s a lot of different names for it. But basically it’s lower carb and more lower glycemic complex carbohydrate, obviously less starches and sugars, and more whole food. It’s more of the monounsaturated fats and saturated fats. Saturated fat is not unhealthy, like butter, like coconut oil and some of those things, but that’s a whole other discussion. But you look at these diets and it’s not a fear of fat, certainly. And those are the ones that are most heart-healthy. Those are the ones that maintain the healthiest weight. Those are the ones that are anti-aging, where you can look at these sirtuin genes. You can look at the telomere length and all that cool stuff, and levels of inflammation and glycation, like I was talking about before. Probably the two best determinants of your aging that you can do with quick blood tests are hemoglobin A1c and CRP c-reactive protein or peptide. So that’s really a measure of your blood glucose, kind of in the longer term with hemoglobin A1c, and then a measure of your systemic inflammation with CRP. And if you look at blood sugar and inflammation, I can tell you basically your chance of getting any of the chronic diseases, your chance of living a long and healthy life, and how you feel right now. It’s pretty crazy. Like it can all come down to pretty much two blood labs, and for $100 I can tell you how you’re doing. And yet—this is a complete aside—no doctors are using them, and it’s really sad. It’s super sad. Anyway, that’s a whole other discussion, so maybe in a future podcast we’ll talk. Shawn: Stay tuned for Part 2 of the ketogenic diet, where we get into not only the science that we’ve covered already, but we’re going to dive deeper into the question “what is the ketogenic diet”, including tips that you need to really be successful at it. How you apply it to your daily life, where people make mistakes. This is where we’re going to dive in so you can really apply this, and hopefully the ketogenic diet can help you or at least you can help a friend that’s doing it. Thanks. Stay tuned. Comparison of a very low-calorie-ketogenic diet with a standard low-calorie diet in the treatment of obesity. Low-Carb vs Low-Fat: Which Diet Is Really Better For You?